Most people have a wireless network in their home these days. So you might think that Powerline networking (aka HomePlug), which uses your home's electrical wiring as a wired data network, is an outdated and redundant technology. But you'd be wrong. Yes, Wi-Fi is convenient and fast − 802.11n technology is widespread and the newest 802.11ac-class routers, like the dual band TP-Link Archer C7 AC1750, promise even zippier connection speeds up to 1300Mbps. However, there's a simplicity and reliability that Powerline offers that wireless technology still can't match. It's not designed to replace a Wi-Fi network. It's supposed to complement one. A Powerline network is essentially a wired network with (mostly) hidden wires. Let's say that you have your broadband router in the hallway and a smart Samsung HD TV in the living room. Let's also say that this particular telly isn't wireless-enabled, so the only way that you can enjoy catch-up TV on it is to trail an Ethernet cable from the router, down the hallway, and across the living room floor to the TV. You try to hide the cable with a big rug. It doesn't work. The Powerline solution is less visible − a 'no new wires' approach. You buy a basic kit, which comes with two Powerline adapters and two short Ethernet cables. You connect one of the Ethernet cables to your router and to the first of the adapters. Then you plug it into the nearest power socket. You click the second Ethernet cable into the back of the HD TV and into the second adapter. You plug the second adapter into the nearest power socket. And that's it. The adapters auto-detect each other (no drivers, no lengthy configuration process) and auto-connect, enabling data packets to whizz from router to TV, travelling along the Ethernet cable, into the first adapter, across the electrical wiring in the walls, out into the second adapter and into the TV. When the first HomePlug Powerline standard was introduced in 2001, data speeds were limited to a sluggish 14Mbps. 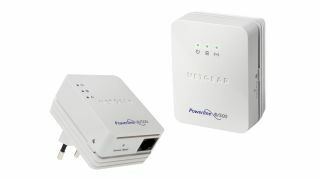 But the newest Powerline products now support Gigabit-class networking. If you've already got a wireless hub, you might not see the point of incorporating Powerline adapters into your home network. But the technology has several advantages over Wi-Fi, namely consistent speeds, reliability, security and ease-of-use. Powerline is a bridging technology, often useful for extending the reach of a home network to places where your wireless coverage is poor, or where you need the fastest connection possible − a games console, perhaps, or an Apple TV. It's also ideal for connecting old devices to the Internet that don't have built-in Wi-Fi connectivity, avoiding cluttering up your living room with a tangle of Ethernet cables. Powerline is a neat and effective networking solution. Powerline technology is arguably more secure than a wireless network too. As data is sent across the copper wiring in your home, it can't be hacked or misused from the outside. Modern Powerline kit also encourages you to password protect your adapters, adding an extra layer of protection. Sending signals across a home's electrical wiring isn't a 21st century idea. In fact, the power companies have been sending control signals over the mains since the 1920s − it's how electricity meters know when to switch to an off-peak rate. The electrical wiring in the average home can support a variety of frequencies. As electricity uses 50/60Hz signals, extra data can be transported along the same wiring at much higher frequencies, without causing any interference. The original HomePlug 1.0 standard (IEEE 1901) accelerated out of the blocks at a somewhat pedestrian 14Mbps, although real-world speeds were closer to 5Mbps. A 'Turbo' upgrade boosted the maximum throughput of version 1.0 to 85Mbps (real-world speeds of around 20Mbps). In 2005, a revamped HomePlug AV boosted the rate even higher, claiming 200Mbps on the box (80-90Mbps in tests) − more than enough to cope with audio and video streaming, hence the 'AV' tag.